Well it's not cup 'o noodles. Ramen is a sacred staple of college life. It’s up there next to the wing-giving red bull, the ubiquitous pumpkin spice latte and honey nut cheerios. Cheap and convenient in a just-add-water kind of way, the ramen we’re used to is always in our hearts, minds and the nearest WaWa. 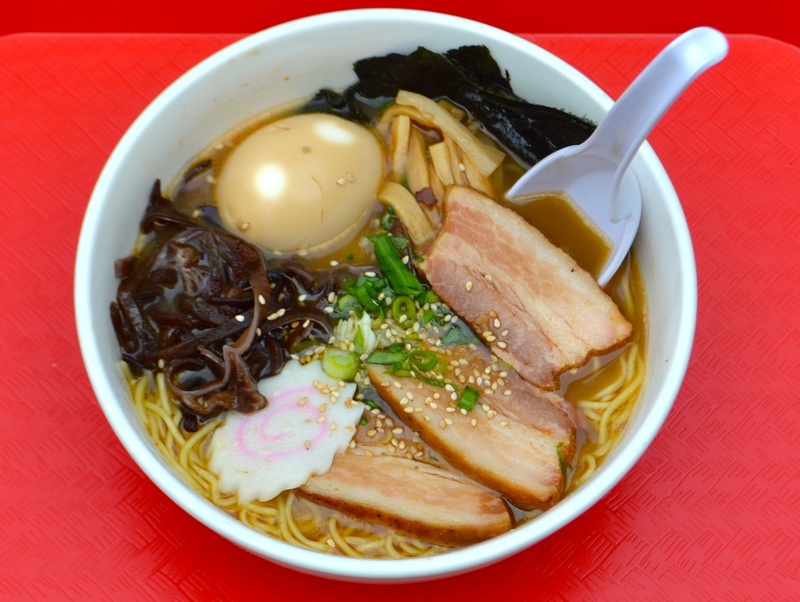 What Nom Nom Ramen offers is entirely different – savory, filling and completely real. Authentic Japanese Ramen really piles it on in a way Cup’O Noodles really can’t compete with. Luckily, you can find this authentic version in the food court near CVS. Nom Nom Ramen’s look is exciting – bright red against black and a deep wood color. This creates a very classic Japanese feel that seems to promise appetizing eats. That is, until you realize you’re between a Quiznos and a Taco Bell. I order the Shoyu ramen with extra chashu pork and a soft-boiled egg. The Shoyu ramen order is a classic, with a soy-sauce tonkotsu broth, chashu, seaweed and some bamboo. The meal comes pleasantly quickly. The golden brown broth looks appetizing although the thin film of oil on top somewhat detracts from the effect. The extra chashu pork is cut unevenly and lumped to the side awkwardly as if it was wondering what it was doing there. The egg looks enticing, light brown and beautiful (my stomach calls to it) until I bite – it’s hard boiled. It’s unpleasant and makes me regret adding it on. I go directly to the seaweed. To my disappointment, it’s completely limp. This doesn’t look like it’ll go well. I take my first bite of the extra chashu pork and oh my god. The pork is redeeming. Exactly as it should be, the pork has a strong flavor and a tender creamy texture owing to the delicious fat sandwiched between the meats. This they do right. It’s definitely worth getting some extra chashu pork. My hopes are raised for the main chashu, but while the flavor is still intense and delicious, the meat is dry and somewhat stringy. The noodles are bouncy and the broth good, but they’re not good enough for me to eat till the bottom of the bowl. Oily and average, Nom Nom Ramen falls under the undesirable niche of almost-worth-it. The Shoyu is a $9 meal before taxes and with the add-ons it approaches well beyond $10. For that price, I wouldn’t go here again. Come to Nom Nom if you’re itching for ramen or if you’ve never had it served like this before. Otherwise, you might find yourself better served at the Taco Bell next door.